Black Friday Slash-A-Ton Sale Event is already here!!! Save 1000's on CPO quality cars without the stress and dealer games. Westcoast Auto is your one-stop-shop to find your perfect car that best suites you and your family needs. A wide range of CPO quality cars of almost all makes and models are cherry picked with low miles and a full service record. At Westcoast Auto we strive to make the sale process as smooth and stress free to all. You can also count on Westcoast Auto staff to find you the best auto loan out there whenever needed. Westcoast Auto Staff, with over 20 years of experience in the industry, can guarantee unbeatable loan rates and term. We have very unique vehicles that are hard to find. Low mileage, color combinations, packages and a full service record is what makes a Westcoast car a one-of-a-kind. ROCK BOTTOM PRICE across the entire inventory. Treat yourself, today and till month end, with the wide selection of nothing but beautiful cars. Slashed to rock-bottom-prices, guaranteed unbeatable loan rates and the best selection of all makes and models. That being said, its the perfect time to get a hell of a great deal. WE ARE THE BEST, and we promise nothing but THE BEST to all our valued customers. Bad credit, no social, please give us a chance to serve you. Check our social media for valued customers testimonials. Even when you'd think a FICO score of 400 is beyond help, check our facebook page and see how many valued customers are driving off with the car of their dream! Whether Bad, good or Excellent credit, no one will get you a better rate than us GUARANTEED. We offer a great extended warranty that is a mirror of the factory warranty with 0 deductible, towing assist, and car rental. Rates as low as 2.24% O.A.C. 0 down and 0 payments for 90 days. We beat KBB instant-cash-offer for your trade. We help deliver cars within a 100 miles for free. We uber our pre-approved customers for up to a 100 miles. Serving our community with the highest reputation ratings for over 20 years. 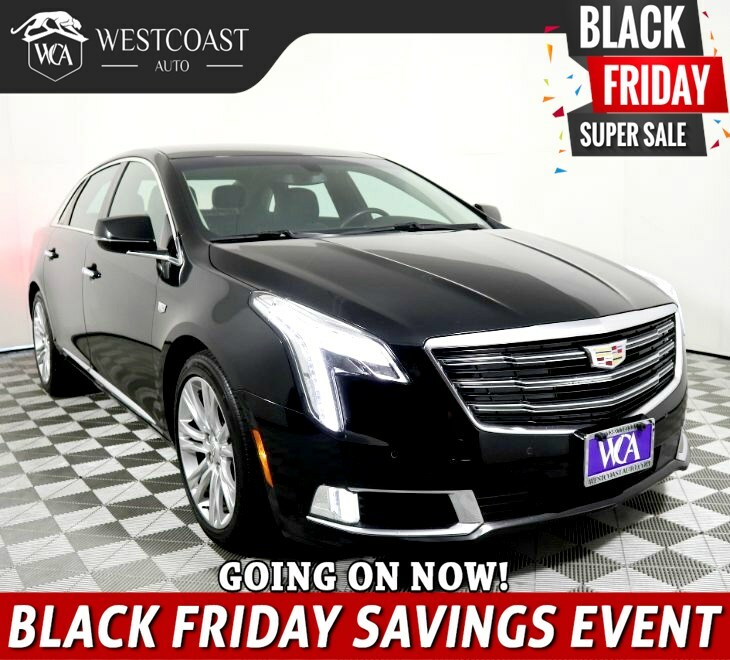 Take your seat in the spotlight behind the wheel of our One Owner, Clean CarFax 2018 Cadillac XTS Luxury Sedan in Stellar Black Metallic as it takes you down the road in luxury and refinement. The 3.6 Liter V6 generates a potent 304hp on demand while paired with a responsive 6 Speed Automatic Transmission. With magnetic ride control and Brembo brakes, this Front Wheel Drive Sedan delivers you to your destination with supreme confidence while attaining near 28mpg. Sleek and elegant, our XTS Luxury boasts a distinct grille, HID headlamps, and stunning wheels to add style paired with ultimate function. The interior indulges your senses with premium materials and innovative technologies. Admire the Cadillac User Experience with embedded navigation that integrates phone, audio, available WiFi, and other technologies into a vivid touchscreen along with a Bose audio system. Supportive power adjustable heated/ventilated leather front seats allow you to sit back and relax as you enjoy such amenities as a heated steering wheel, heated rear seats, push-button start, adaptive remote start, and dual-zone automatic climate control. Did you see the navigation? Dynamic in performance and opulent in design, our XTS is your ultimate reward that allows you to drive confidently with a high-strength steel alloy safety cage, an automatic headlight system, front/rear parking sensors, anti-lock disc brakes, stability control/ traction control, and a multitude of airbags. Reward yourself with the power and prestige that only a Cadillac can provide. Print this page and call us Now... We Know You Will Enjoy Your Test Drive Towards Ownership! Great quality, easy financing and affordable prices aren't the only things that make Westcoast Auto Sales the first choice of many discerning auto buyers. Stop in and See California's Dealer of the Year!